A twist on a non uniform day! 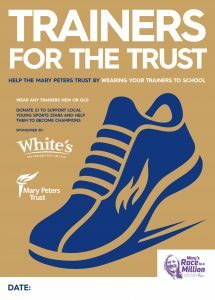 Will your school, college or even workplace wear their trainers for a day? Pay just £1 per person and help the sporting stars of the future. You can even be a bit more active on the day or dress your trainers up for fun! This event is sponsored by White’s Oats Porridge.